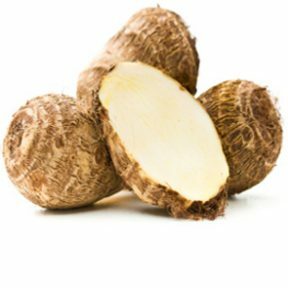 Eddoes, also commonly referred to as Taro, is a starchy root, similar to yam in appearance, and has an interesting, nutty flavor with a combination of potato, waterchesnut and artichoke flavors. It is delicious deep-fried, boiled, roasted or pan-fried. It is also great in stews or soups. The root must be peeled prior to cooking, as you would potatoes. If you’ve sampled poi at a Hawaiian luau, then you’re already familiar with taro. In its raw state, it can be toxic and harsh on the skin, so wear gloves or oil your hands when handling it, and always cook it before serving it. Names: Eddoes, Taro, Edos, Taro Root, Cocoyam, Japanese potato, Baddo, Elephant’s ear, Sato-imo. Source: Asia, Caribbean, Central and South America. and the United States (South Florida).